Learning is pivotal to success in today's business. Here is a framework to help you learn quickly and effectively. Learning is pivotal to success in today’s business. But we don’t know how to learn, unlearn and re-learn. 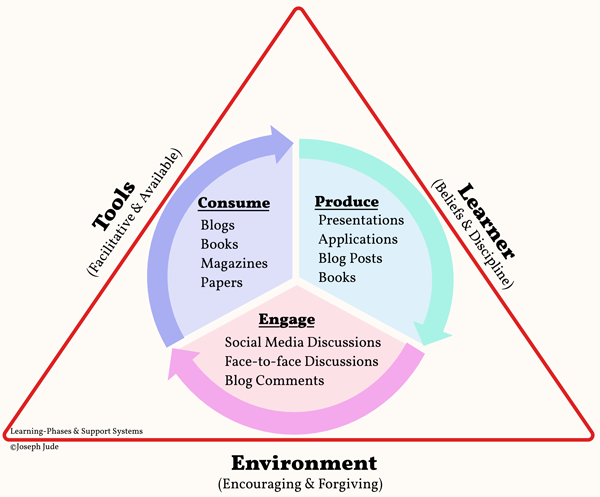 I have formed a simple framework consume-produce-engage for self-learning. Here I share the framework and how I use it. Bookmark this page and come back for updates. Or subscribe via RSS. Learning Phases And Its Support Systems: Start here. I introduce the framework and talk about all aspects of the framework. How To Be A Champion And Remain One? : An initial post about the framework. Build An Ecosystem For Learning: Learning is a living being. Living happens within a ecosystem. So build an ecosystem for your learning. Challenges In ‘Consume’ Phase Of Learning: To learn successfully, you need to learn from authentic sources with a structure. Challenge is in discovering these sources and framing a structure. Documenting Your Decisions: Always document the content of a decision. You’ll be surprised how this one activity can improve your decision making capability in the long term. Are You Learning A New Domain? Visit Its Zoo: If you are learning about a new domain, learn about its individual entities well before jumping into its ecosystem. Do Credentials Matter? : One’s credentials do not guarantee success; it’s their attitude that makes or breaks a venture. How I Use Twitter As A Learning Tool: Of all the social media platforms, Twitter stands-out as a great place to discover and discuss ideas. Use it.